If you’ve ever visited Biltmore House in North Carolina, you may recognize this work. “The dance” hangs in the banquet hall there. 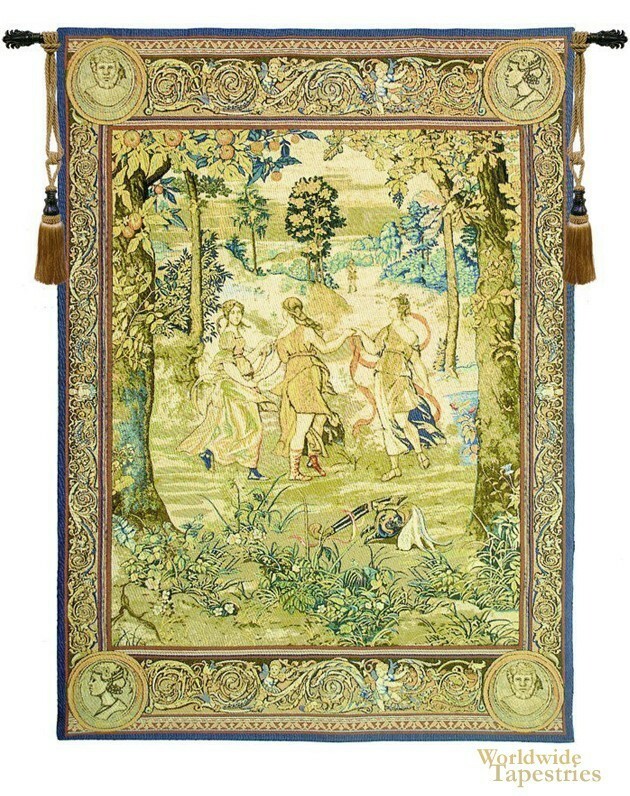 It is one of the grandest of wall hangings, both in detail and scope. The scene depicted is a dance. Three figures from Roman mythology celebrate the joy of love in a clearing in the woods. The detail is outstanding, from the flowers in bloom in the foreground to the trees in the distance. The border features four Roman sculptures, one in each corner. The balance of the border features an ornate pattern with cherubs and urns; classic Roman themes. The original was woven sometime between 1546 and 1553. This tapestry is lined and has a tunnel for easy hanging.